Seven-hundred and fifty Harvard University dining hall workers, members of the union, UNITE HERE Local 26, went on strike October 5. It was the first strike at Harvard in over thirty years. Dining-hall workers have been supported by students, the community, and have an editorial in the NY Times. Almost half the dining halls at Harvard were immediately shut down by the strike. “Si, se puede!” and “Hey, Harvard you can’t hide, we can see your greedy side” were two of the more popular chants in the large and loud picket lines of hundreds of workers who were joined by students and supporters from other unions and the community. The strike had a high level of energy and an unusual amount of union member participation compared to strikes in recent years. The workers were striking to stop drastic increases in their health insurance costs, to get decent raises of 22% over five years and for a meager starting salary of only $35,000 per year. And, because the university shuts down dining halls and cafés during vacations and summers, most of the dining hall workers are “dismissed” for as much as four to five months, without eligibility to receive unemployment benefits. So another important demand is for jobs during the vacations and summers, at equal rates of pay to their dining hall work. The need to strike was rooted in the high cost of living in the Boston area, previous concessionary contracts with Harvard, and the lack of work and pay over the summers and holidays. Health care costs are already $281 a month for those with family coverage and many workers are unable to afford Harvard’s health care plan at all. Four months of difficult contract negotiations with Harvard resulted in management ignoring the obvious needs of the dining hall workers. Harvard management repeatedly demanded increased health insurance payments, low raises, and no solution to lack of work over the summers and holidays. The Harvard Corporation, the owners of Harvard, for the equivalent of pennies on their end, could have given the workers what they wanted and needed, months ago. Harvard has an endowment of $35 billion dollars and many other sources of income making it the richest university in the world. The interest accrual alone on Harvard’s endowment could satisfy the workers’ demands. Within the last two years, Harvard has raised $7 billion in endowment fundraising alone, and they brag they will reach $9 billion before their current fund drive ends. Harvard was intent on starving the workers back to work. However the strikers were solid and united, despite the hardship of being on strike. As the strike entered its third week, some workers began to say they didn’t expect to be out so long. With extremely high cost of living in the Boston area the strikers can barely make ends meet – even when they are working at Harvard. The union is providing each striker a daily stipend of $40, there are donations of food, and solidarity donations from outside the union. But being without a paycheck was difficult. But it wasn’t all hardship. There were many moments during the strike where the workers got together, made themselves heard and started to feel their power. The strike had a lot visibility. The strikers and supporters made a lot of noise, stirring things up in Harvard Yard. Drumming of all sorts was part of most of the marches and picket lines. There was a lot of well-deserved anger, pent up over the years, at the injustice on display from a massive corporation like Harvard. In addition to frequent picketing, there were at least three rallies of 300-400 each. In acts of civil disobedience, eleven union members, leaders, and strike supporters were recently arrested, sitting in the street, blocking traffic in busy Harvard Square. Truck drivers in Teamsters Local 25 are refusing to deliver food. Construction workers with IBEW Local 103 are in solidarity and they held brief work stoppages on some Harvard construction projects. Union members from the Harvard Union of Technical workers, from other unions like the Massachusetts Nurses Association, and members of Socialist Alternative and Socialist Students are joining the picket lines and rallies. Student support for the strikers was high, led by the Student Labor Action Movement (SLAM). A high level of faculty support was reported as well. SLAM organized two student walkout of hundreds each, in solidarity with the strike. “Harvard is choosing money over people. At the first walkout, 500 students left class in support of dining hall workers, but apparently this wasn’t enough for Harvard to make the right choice to end the strike … it’s essential to demonstrate how much we support HUDS workers. 3,088 students have signed the petition but it won’t make any difference if we don’t convert our support into action… and make Harvard end the strike now!” (SLAM statement during the strike). The Massachusetts AFL-CIO sponsored a strike support rally on Cambridge Common, on Saturday, October 22, a few days before the tentative strike settlement was announced. Over a thousand union members and supporters attended the rally. The Cambridge police were taken by surprise when the rally turned into a march and took over a main street to march to Cambridge City Hall. On Monday, October 24, a second student walkout happened in the afternoon. A Socialist Alternative member present noted that the speeches at this second walkout were “getting more radical and speaking more about wealth inequality.” The walkout turned into a march by students, strikers, and supporters. An occupation began of the lobby of a Harvard building where negotiations were being held. The core of the occupation was about 120 students sitting in. The occupation lasted until 10:30pm and some students, supporters, and union members stayed in front of the building until 2am when a tentative settlement to the negotiations was announced. This temporary occupation of a building lobby resonated with many at Harvard who still remember the 2000 sit-in for a living wage at Harvard. The President of Harvard’s offices and other rooms in a Harvard building were occupied in support of a living wage for all Harvard workers. Even this relatively brief occupation/sit in for the strikers helped push the negotiations in the union’s favor. It’s certain that Harvard management was seeing the potential for students and workers to escalate tactics to occupying more of Harvard until the contract was settled. The strike ended early in the morning on Wednesday, October 26. 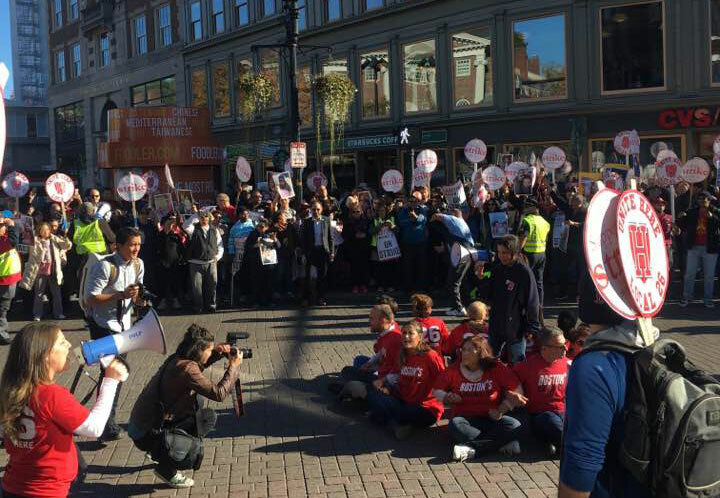 As word got around, strikers and supporters were celebrating in Harvard Square. Picket lines remained in place as a union vote on the contract was organized. The vote ended up 583 to 1 in favor of the five-year contract. The demand for a base wage of $35,000 per year for full-time dining hall workers was won. Retroactive wage increases will be 2.5% per year of the contract. Also, Harvard’s attempt to raise health care costs was stopped. Workers will be subsidized through a flexible spending account for out-of-pocket reimbursement funds for the length of the contract. Workers who are “dismissed” (laid off) during the summers and holidays will receive seasonal pay of $2,400, going up to $3,000 by 2020. In addition, the contract settlement states that Harvard University will reimburse dining hall workers medical costs, insurance costs, and transportation costs during the strike. Also, a “Diversity and Equality Committee will be created to address concerns regarding diversity and equal treatment of Harvard Dining Hall employees” according to the UNITE HERE Local 26 press release. The energy of the strike and the solidarity from union and non-union workers were truly impressive. While certain gains, like more summer work, were not met, the contract settlement either held the line for the length of the contract or made important improvements. This strike victory will hopefully energize other unions in struggle and embolden those holding back in fear of using strikes to win gains. In Boston, subway workers and bus drivers in ATU are in struggle against privatization. Local 26 may soon be back in struggle for a contract for dining hall workers at Northeastern University. Union janitors in SEIU at Tufts University and at Harvard are in struggle as well. Mobilizing the membership of unions to go on strike, using bold tactics like direct action and occupations, and organizing mass solidarity from union and non-union supporters are all absolutely necessary now. Symbolic picket lines and token displays of solidarity from unions not directly involved are no longer successful. There is a real need at Harvard University and beyond for unions to start negotiating together, going on strike together and organizing solidarity from working people in general in every struggle and using gains made, like in the Harvard dining hall workers strike, to step up union organizing. Previous articleProtest the Eviction of the North Dakota Native Americans’ Protest Camp!